You are here: Home › Exhibition reviews › Objects and visual analyses › Bunjilaka’s Two Laws & Koorie Voices: Museums, Indigenous Communities and Institutional Critique. Bunjilaka’s Two Laws & Koorie Voices: Museums, Indigenous Communities and Institutional Critique. This quote serves as the large heading for the permanent exhibition Two Laws in Bunjilaka, the Melbourne Museum’s Aboriginal Cultural Center. It is displayed alongside a number of Koorie artifacts and a life group-style, life-size model of their collector, Baldwin Spencer, the prominent anthropologist who directed the museum between 1899 and 1928. In this position, he carried out fieldwork and collected in Aboriginal communities around the town of Alice Springs in Australia’s Northern Territory. The exhibition’s head curator John Morton has described this strategy of exhibiting the collector alongside his collection as a “parody of standard museum display-practice” and “museuming the museum, although here the key audience is Indigenous Australia” (2004: 55). My first visit to the center – and the Two Laws exhibit in particular – initially sparked my interest in the relationship between museums and Indigenous communities prior to having ever come across the terms of New or Critical Museology. Two Laws and Koorie Voices – another permanent installation in Bunjilaka’s Jumbanna (‘Storytelling’) gallery space – critically negotiate some of the reoccurring themes of our seminar concerning the interrelations between anthropology, museums and indigenous communities – such as collection and exhibition practices, issues of intellectual property rights as well as ethnographic photography. The opening of the Cultural Center in 2000 falls into a period which is marked by the museological shift from a narrow anthropological focus on Aboriginal culture to broader, interdisciplinary perspectives (Healy 2006: 16.2). This translated into major institutional transformations aiming to find innovative approaches to address these issues, in an environment characterized by a major restructuring of the public sector and changing conceptions of visitor expectations. 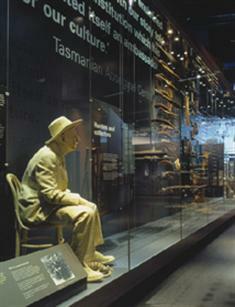 The exhibitions at the National Museum of Australia in Canberra and their representation of Australian history have been at the center of much conservative critique claiming that past injustices have been overemphasized while the views of those who were previously thought to have greatly contributed to national history remained excluded (Dean/Rider 2005: 37). At the same time, critical scholars have asserted that immersive exhibition strategies – often employing ‘new media’ and focusing on visitor experience – have compromised the possibility of museums to act as a public forum for the sake of a dramatized “taxonomical control over difference” (Apparundai 1996, quoted in Williams 2006: 20). These new institutions then exist in an area of tension between the challenges of representing a history which has ceased to be a single, grand narrative in a way that encourages public dialog, while having to respond to the pressures of a more market-oriented concept of the public sphere. I want to inquire how Bunjilaka’s Two Laws and Koorie Voices exhibits respond to these issues and which role they ascribe to national museums with regards to the complexities of postcolonial societies. I will conclude by considering the center’s approach relative to its own position within the Melbourne Museum which Bennett has described as “in […] it and not in it, of it and not of it” (2006: 8.15). The Two Laws exhibit consists of two parts – the display in the cabinet as briefly described in the introduction and a video installation. In the glass case, the model of Herbert Spencer is provided with a label that highlights the museum’s recognition of his pivotal contribution to the institution’s history, but at the same time invites critical reflection on part of the visitor regarding turn-of-the-century collection and exhibition practices. This is further emphasized by the case’s display of other, predominantly Aboriginal objects, which at first sight resembles the familiar style of modern museum displays with respect to lighting, monochromatic backdrop, label design, and near-invisible mounting. Yet, instead of information about the objects themselves, the labels convey stories about their collectors and the museum’s past preservation practices. Spencer reappears in the second part of the Two Laws exhibit consisting of two large video screens from which a fictional version of the anthropologist and a second actor playing Irrapmwe enter into an argument. Irrapmwe was a leading Aboriginal elder of a community in Alice Springs in 1899, when Spencer published his seminal work Native Tribes of Central Australia with Frank Gillen. The dialog weaves into a single narrative the themes of Indigenous property laws, the desire for self-representation, Aboriginal control and access to the cultural heritage material held by museums, and the role of academic experts and Aboriginal representatives in the development of Indigenous policies (Morton 2004: 55). Spencer’s statements express the obliviousness and ignorance towards these issues characteristic of Museum Age anthropology. After the anthropologist receives a couple of “critical blows” by Irrapmwe, the two men eventually come to an agreement as the Aboriginal elder can convince Spencer to revise some of his views (Morton 2004: 56). The dialog thus corresponds with the reflexive and confrontational tone of the display in the cabinet in addressing the museum’s colonial baggage. However, as the two men eventually come to terms, it simultaneously expresses the potential for reconciliation. Tony Bennett’s account of Baldwin Spencer’s contribution to the Museum of Victoria’s research and collection profile and his subsequent involvement in the government’s administration of Aboriginal affairs, demonstrates how these two roles were closely interrelated. This relationship was mediated through the object-based epistemology that characterized the development of the anthropological discourse (2006: 8.11). Spencer’s introduction of typological ordering principles into the museum’s collection of Aboriginal artifacts constitutes the application of evolutionary natural science models and their translation into anthropological knowledge through a particular configuration of the relationships between objects. According to Bennett, the arrangements which materialized within the institutional context of museums were “producing a distinctive kind of objecthood” (8.09) by which the artifacts were summoned into the more abstract narrative of Social Darwinism. In his later administrative role for the Commonwealth government, Spencer employed the “principles of sequence” which governed his typological arrangements in the development of “civilizing programs” for Indigenous communities (Bennet 2006. 8.11). This saw the removal of people who fit the racist construct of ‘half castes’ from their communities as the “white” share of their biological heritage was assumed to signify “developmental possibilities” (ibid.). Their institutionalization into educational facilities then constitutes “the movement of bodies through social space as if they were so many museum pieces moved along a continuum of development” (ibid). This explicates how museum were not just involved in the construction of degrading images of Aboriginal communities, but also how their institutional role of classifying and arranging artifacts actively shaped the “contours of [..] social management” (ibid.) through the mobilization of ordering principles outside of museums. The video then explicates some of the complex relationships between museum representation and the colonial reality faced by Aboriginal people. While it can be said to simplify some of the issues at hand for the sake of making them accessible to a broad audience, it resists the criticism that the use of digital media, immersive display strategies and a focus on visitor experience necessarily de-politicize the representation of cultures within a national frame. Rather, the dispute mediates different cultural identities and suggests the possibility of reconciling the ruptures of Australia’s colonial legacy and the role museums might play in this process as a space for dialogic encounters. With regards to this, the exhibit makes use of the very principles by which museum practice has inscribed its objects with meaning to reveal that the institution has never assumed an objective, apolitical role. 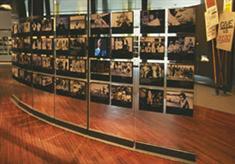 The most prominent piece of the Koorie Voices exhibit is a gallery of 500 photographs depicting Indigenous Victorians. The images are interspersed with video screens showing members of the Koorie community who recount personal stories. This part of the exhibit reflects some of the themes covered by the displays in a glass case – the central icon of the Koorie Voices installation, which is concerned with the various forms in which Aboriginal people were institutionalized by the Australian government. It includes two plaster busts of Aboriginal people from the Victorian Coranderrk reserve that were created by artist Charles Summer in 1866. The label traces the histories of exchange and colonial exhibition which are inscribed in these objects and contextualizes them as material manifestations of “the western scientific tradition which concerned itself with measuring and documenting the indigenous people before their ‘inevitable’ demise” (Bunjilaka 1). How does the photography gallery refer to the ideological and historical narratives represented by the busts to form part of a display strategy that intends to “challenge the notions which the cube embodies” (ibid)? Koorie Voices highlights Aboriginal people’s resistance and ability to withstand the attempts at control and assimilation they were subjected to in the missionaries and reserves. I argue that the image gallery embodies the way in which photographs are susceptible to an opening to counter-narratives, subverting the authority of the museum and the “colonial memories embedded in the histories of collections, collectors and displays” (Healy 2006: 16.1). The photography exhibit can thus be understood as a visual translation of the process by which alternative historical narratives are created around images in the course of community consultation and involvement. At the request of Victoria’s Aboriginal elders, the Indigenous collections of the Melbourne Museum are stored and managed in Bunjilaka, separately from the rest of the institution’s holdings. The center houses a private Keeping Place, where members of Indigenous communities can meet and view their cultural heritage material. This structure makes up the institutional background for the production of a catalog of over 2500 photographs of Aboriginal people that was sent out to local Koorie communities and asked them to provide their own descriptions in order to improve the knowledge about the collections (Edwards 2003: 94). This practice describes a journey of the photographs that Elizabeth Edwards has termed “From ‘The Archive’ to ‘Living Entity’” (2003: 92), which embodies the quality of photographic images as a “visual legacy […] of encounters and relationships” (ibid: 83) that link past and present and open up an interpretative space which is never limited to one ultimate meaning. According to Christopher Pinney, the archive functions as a “vast linguistic grid” disciplining the multiplicity of meanings inscribed in photographs by providing them with a “structuring certainty” that is indicative of a particular world view (1992: 90). With regards to the colonial legacy of collections, images of Indigenous people were (and often continue to be) enmeshed in the ‘grand narrative’ of human evolution in much the same way as the bust on display in Bunjilaka. This corresponds with the chemical process by which “photographs translate the flow of lived experience into a series of still, muted fragments of space and time” (Edwards 2003: 84). Thus, the archival discipline imposed on the images exemplifies the larger process of silencing Indigenous voices in preparation for their subjection to a developing scientific discourse. In the context of Museum Age anthropology, photographic objects then assumed the role of active social agents in the construction of meaning about cultures. Flowing “ceaselessly around [scientific] networks”, they were involved in the generation of theories about the origins of humanity, which was largely based on specular practices (Edwards 2001: 31). Within the represenational framework of museums, they also operated as a visual validation of the views expressed in the display and arrangement of cultural objects – a performance which locates them on yet another “trajectory of institutional meaning” (Edwards 2001: 40). This accumulation of disciplinary and institutionally regulated meanings becomes inextricably linked to the construction of the photographic object – “as if [it] were initially intrinsic to it” (Edwards/Hart 2003: 49). As knowledgeable artifacts, they cannot exist outside of their discursive constitution as colonial records turned anthropological data through their involvement in institutional structures and networks. Thus, it is impossible to look at an image taken for colonial administrative purposes and ignore the “asymmetries of power” (Edwards 2001: 11) that were acted out the moment of production, as they have left a significant imprint which continues to shape the experiences of Indigenous people. However, the potential re-insertion of these images into the individual or collective memories of family or community history can reveal points of fracture in this performance. The exhibit’s critical reflection of the institutional inscription of colonial history is then based on the potential of images to act as “points of intersection” between the production of different historical narratives (Edwards 2003: 91). This process opens up an interpretative and interactive space that is structured by the dynamics of the community. By the removal of the photographs from the structural authority of their institutional context, this collaboration works to fragment and decenter the archive in recognition of differing “visual economies” and the liberation of “Indigenous voice[s]” (ibid: 85). In displaying a significant percentage of the images, which have been invested with new and subversive layers of meaning, Bunjilaka’s achievement is twofold. First, it highlights the diversity of Victoria’s Aboriginal community which resisted the homogenizing efforts of colonial institutionalization, in which the images themselves were initially bound up. Further, by interspersing them with video screens whose images resemble the formal qualities of the adjacent photographs, the exhibition can be read as a translation of Edward’s notion that objects embody a form of “active agency” capable of shaping responses to them (2001: 17). By invigorating the images and giving them a voice, they engage the visitor in a dialog and inverse the effects of past institutional orderings to bring into visibility those histories, which had previously been silenced by the dominant language of the hegemonic discourse. The latter is critically reflected through the display’s references to the tropes structuring the central display in the glass case, which – among others – take on the form of quotations from government reports and settlers’ diaries. Thus, the invisibility of the photographer – corresponding with the ethnographic mode of “objective” textual production (Pinney 1992: 76) – is inversed by making visible the world views informing the policies imposed on Aboriginal people. This serves to deconstruct the alleged scientific disinterestedness as a crucial feature of the authoritative claims to knowledge and truth, which were reinforced by the interrelations of modern anthropology and museums. Thus, Koorie Voices translates the principles of Aboriginal “ownership and interpretation of the [..] Cultural Heritage material in Museum Victoria’s collection” (Bunjilaka 2) into the language of exhibitions. The Bunjilaka redevelopment blog states that the photo gallery has been one of the most successful parts of the exhibit as a “place where our Koori community can connect with culture and family” (Bunjilaka 2010). This indicates that the images continue to play an active and empowering role in the formation of community networks and suggests how Koorie Voices might be understood as partly overriding the division between the exhibitions at the Melbourne Museum and the institution’s collection. In conclusion, the immersive display strategies which materialize in the use of digital technology and fictional historical characters anticipate the concept of the ‘visitor as consumer’. However, the way Bunjilaka employs this kind of infotainment does not imply a passively immersed audience. Rather, these display elements actively contribute to a dialogic exhibition strategy which works along the lines of a Critical Museology by problematizing the very purpose of museums. However, I partly share Chris Healy’s critique that the cultural center is both enabled and restricted by a position which is highly independent and somewhat detached from the museums overall framework (2006: 16.6). The fact that institutional critique is now (safely) located in the distinct places of Aboriginal autonomy can lead to a perception that non-Indigenous exhibits do not carry the same responsibility to address their colonial legacy. The politics of representation risk to be relegated solely to the realm of the “Aboriginal Problem” and in the process obscure the mechanisms of exclusion and the production of particular subject-positions, which have affected class and gender-relations within the broader Australian society. An institutional critique addressing the problems associated with traditional museum display- and exhibition strategies could have a sensitizing effect with regards to non-Indigenous responses to the issues raised by Bunjilaka. Bennett, T. 2006: Civic laboratories: Museums, cultural objecthood and the governance of the social. In A. Witcomb, C. Healy (eds.) South Pacific Museums: Experiments in Culture. Clayton: Monash University Press. Bunjilaka (1): Bunjilaka: About the Exhibitions. Melbourne: Museum Victoria. Bunjilaka (2): What is Bunjilaka. Melbourne: Museum Victoria. Bunjilaka redevelopment blog, 2010: Redeveloping Koorie Voices. Melbourne: Museum Victoria. Dean, D. and Rider, P. 2005. Museums, nation and political history in the Australian National Museum and the Canadian Museum of Civilization. In Museum and Society 3 (1): 35-50. Edwards, E. 2001. Raw Histories: Photography Anthropology and Museums. Oxford: Berg. Edwards, E and Hart. J. 2003. Mixed box: The cultural biography of a box of ethnographic photographs. In Photographs Objects Histories: On the Materiality of Images. London: Routledge. Edwards, E. 2003. Introduction. In A. Brown, L. Peers (eds). Museums and Source Communities. London: Routledge (pp. 38-99). Healy, C. 2006: Very special treatment. In A. Witcomb, C. Healy (eds). South Pacific Museums: Experiments in Culture. Clayton: Monash Univ. Press. Jenkins, David. 1994. Object lessons and ethnographic displays: Museum exhibitions and the making of American anthropology. Comparative Studies in Society and History, 36 (2): 242-270. Morton, J. 2004. “Such a man would find few races hostile”: History, fiction and anthropological dialogue in the Melbourne Museum. Arena Journal. 22: 53-71. Pinney, C. 1992. The parallel histories of photography and anthropology. In E. Edwards (ed). Anthropology and Photography. Yale: Univ. Press. Shelton, A. 2001. Unsettling the meaning: Critical museology, art and anthropological discourse. In M. Bouquet (ed). Academic Anthropology and the Museum. Oxford: Berghahn. Williams, P. 2006. Reforming nationhood: The intersection of the free market and biculturalism at the Museum of New Zealand Te Papa Tongarewa. In A. Witcomb, C. Healy (eds.) South Pacific Museums: Experiments in Culture. Clayton: Monash Univ. Press.